At the command of King Charles I, the famous “Sovereign of the Seas” was built in 1637. She cost more than £40,000 - a sum equivalent to an amount many times greater to-day. After an eventful life this wonderful ship came to an ignominious end. 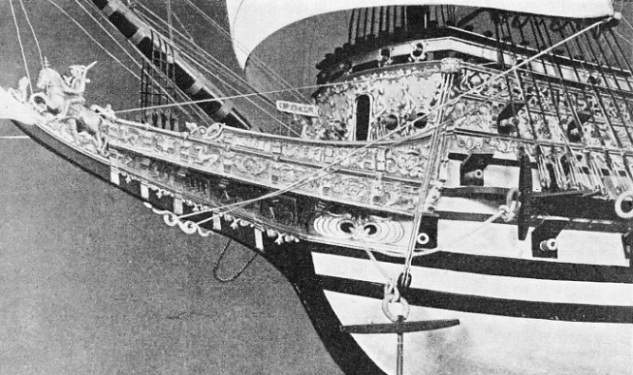 AN EXAGGERATED BEAK HEAD in the Sovereign of the Seas provided magnificent scope for a lavish and elaborate figurehead. The carving represented King Edgar on horseback trampling on the Seven Kings. On the forward bulkhead were six emblematic statues. This illustration shows the details of a model made by Henry B. Culver of New York. EVERY period of naval architecture has produced its wonder ship. In the history of the British fleet there are many conspicuous wonder ships from the Great Harry to the Hood. 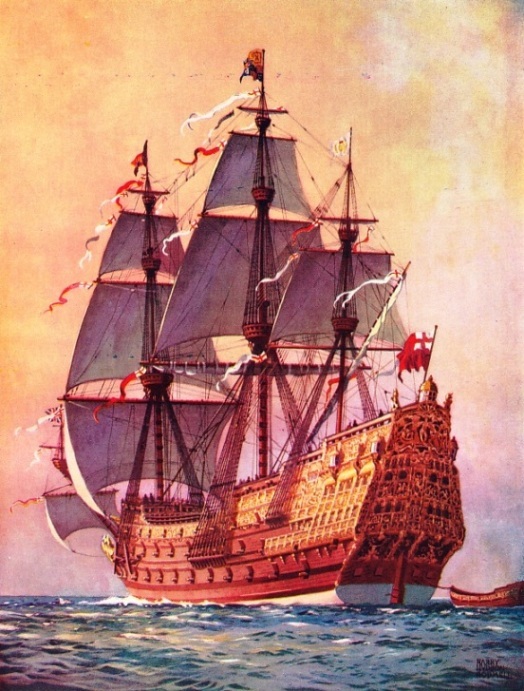 Perhaps the most interesting of all is the Sovereign of the Seas, built in 1637. Not only was she an outstanding vessel in design and history, but also she had a material influence on the whole course of Britain’s story. Her origin was due to King Charles I, who at that time fully appreciated the importance of the Navy to the country’s safety. He outlined the plans of the mightiest ship which had ever been conceived, a vessel of no less than 1,500 tons burden. The naval experts of the day were staggered at the suggestion. The Brethren of Trinity House, already hard put to it to maintain the ports and fairways in navigable condition with little money, protested that, even if she could be built with safety, such a ship was far too big to be practical. But the King was adamant; he had made up his mind to have the finest man-of-war in the world. Having secured the consent of a reluctant Admiralty, he instructed Phineas Pett, the most prominent naval architect of that day, to prepare a full model of the projected ship. Pett conferred with such noteworthy colleagues as Sir John Pennington, Sir Robert Mansell and Master John Wells, the storekeeper at Deptford Dockyard. Eventually, apparently after much argument, they produced a plan for a ship which was estimated to cost £13,680. The King was graciously pleased to approve, and Pett was ordered to superintend the building of the ship. Immediately the plans were passed Pett went to the north of England to select and prepare the necessary timber, for it was doubtful if the Home Counties could produce what was wanted. Workmen with all their stores and provisions were sent by water to Newcastle-on-Tyne and the first timbers were shipped to the London River by chartered colliers and by naval storeships. On December 21, 1635, a certain amount of material having arrived, the keel of the ship was laid at Woolwich Dockyard. She demanded all the resources not only of Woolwich, but also of Deptford. Even so, it took twenty months to bring her to the launching stage, and it was obvious that the estimated cost would be much exceeded. The wages bill alone was nearly £21,000 and the total cost was finally returned at £40,833 8s. 1½d. This included no less than £6,691 for decoration. While the ship was on the stocks the King’s enthusiasm increased steadily. He paid a number of visits to Woolwich Dockyard to watch the progress. As is usual in a Court, the fashion became general, and the mighty ship was the great topic of conversation. The King’s interest appears to have been practical, for he noticed the amount of waste material that was collecting round the slip -already regarded by the workmen as “chips” which it was their perquisite to take home - and he ordered two small pinnaces to be built of this waste. These were subsequently added to the fleet as the Greyhound and the Roebuck. The King himself chose the name of Sovereign of the Seas for the great ship. 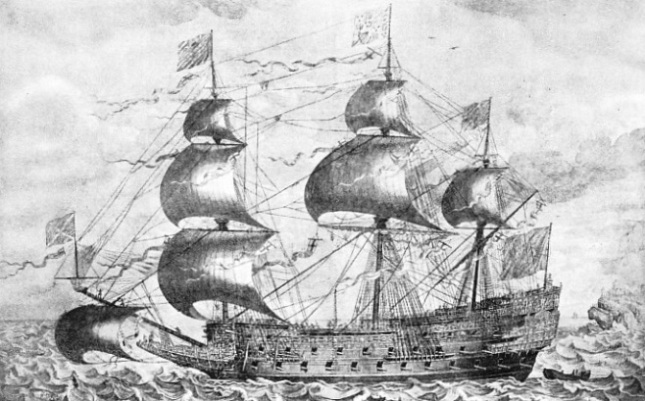 JOHN PAYNE’S FAMOUS CONTEMPORARY ENGRAVING of the Sovereign of the Seas shows that she was unique because she set royals on foremast and mainmast and a topgallant sail on the mizen. These sails were not generally used until later by English men-of-war. The Sovereign of the Seas had a tonnage of 1,522 (1,683 by the old measurement). She originally had a length of 127 feet on the keel, a beam of 48 ft 4-in and a depth of 19ft 3-in in hold. Considerable structural alterations were carried out in 1651 and 1659. It was planned that she should be launched on September 25, 1637, in the presence of the King and Queen, the whole court and a large party of guests. About £500 were spent on preparations for the launch and the entertainment of the party, from which selected members boarded the ship on the stocks and thoroughly examined her. Then came the fiasco. She stuck fast and nothing could move her. There was consternation among the dockyard officials, but the King was reasonable and recognized that it could not be helped. He promised to come down on the next favourable opportunity, and the launch was fixed for the spring tide of October 14. On the Saturday night before the date of the launch a heavy gale from the eastward brought an abnormal tide up the river and the ship was in danger of dashing herself to pieces. So the master builder of Woolwich took on himself the responsibility of launching her and getting her made fast to the wharf. The King was then in residence at Hampton Court, too far away to be called, but Pett rode post-haste to Sir Robert Mansell, Vice-Admiral of England, who lived at Greenwich. The situation was hurriedly explained and Sir Robert rode back to the dockyard with him to perform the christening ceremony. In those days it was always held after the ship was afloat. The picturesque ceremony was carried out by the flickering light of torches in a full gale and must have been one of the most impressive ever held. While the ship was being rigged at Woolwich the King again visited her and looked into every detail closely. She was certainly a ship in which he could take pride as she lay there by the fitting-out wharf, not yet tested by bad weather. She was the first three-decker to be built for the Navy, having three flush gun decks in addition to the forecastle, half-deck, quarter-deck and roundhouse. Her towering stern dwarfed the bow, which was built with the exaggerated beak head that had been inherited from the galley and which was to cost the Navy many lives before it went out of fashion. This beak gave a wonderful opportunity for decoration. The elaborately carved figurehead represented King Edgar on horseback trampling on the Seven Kings. On the stem Cupid bestrode a lion and on the forward bulkhead six emblematic statues were placed. The stern offered even greater opportunity for masses of elaborate carving and decoration. Her dimensions were given as 127 feet on the keel, 167 ft 9 in overall, with a beam of 48 ft 4 in and a draught of more than 19 feet. Her tonnage by the old measurement was 1,683, and she was intended to have a complement of 600 men. Her high sides and lofty rig offered tremendous resistance to the wind and her design provided for no fewer than eleven anchors, of which the biggest weighed 4,400 lb. THE FINEST MAN-OF-WAR OF HER TIME, the Sovereign of the Seas marked an important stage in the development of naval architecture. She was designed by Phineas Pett. On September 25, 1637, King Charles I was present at the launching ceremony at Woolwich. She stuck on the slipway, however, and was not launched until some weeks later. The total cost of the ship was £40,833 8s 1½d, of which £6,691 were spent on her extravagant decoration. Her stern towered to a tremendous height and made her unsuitable for service at sea until 1652 when Cromwell had her reduced to a two-decker. Cromwell had her renamed Sovereign. Popular demand refused to allow the Puritans to deface her gilded decorations. Her yellow hull and gilded ornament therefore made her conspicuous in naval engagements with the Dutch, who gave her the nickname of the “Golden Devil”. At the Restoration in 1660 she was renamed Royal Sovereign and in subsequent actions set a noble example to the successors to her name. On January 29, 1696, through a watchman’s negligence, the famous ship caught fire in what is still called Sovereign Reach of the River Medway, at Chatham. She was completely destroyed. Her side was pierced for thirty ports in the lower tier, thirty in the middle and twenty-six in the third, with a further twelve in the forecastle and fourteen in the half-deck. In addition there were thirteen or fourteen ports for mounting “murdering pieces” to sweep the deck if enemy boarders got a foot-hold upon it, and the cabin bulkheads were loopholed for muskets. Nominally she was a 100-guns ship but she mounted 102 guns. On the lower deck there were twenty cannon drakes and eight demi-cannon. On the middle deck there were twenty-four culverin-drakes and six culverins. The other guns were on the main and upper decks. It was mainly to meet the colossal cost of this ship that Charles I insisted on raising the hated Ship Money which fired the mine of popular dissatisfaction. The Sovereign of the Seas led the Ship Money Fleet to sea, after the King and Queen, with a small party, had again visited her and dined on board. It was soon obvious that she was far too high for sea service, and she did little practical work before or during the Civil War. Fortunately it was only the sailors who knew of her faults. The Navy, however, had an extraordinary affection for her, so that when, on the day of Charles I’s execution,it was announced in the House of Commons that her name was to be changed to Commonwealth there was so much dissatisfaction in the Fleet that Cromwell, who wanted to keep it loyal to his cause, gave in and only changed the name to Sovereign, carefully explaining that this signified “The Sovereign People”. Cromwell was not the man to have a useless unit in his fleet, especially such an expensive ship as the Sovereign. In 1652 she was cut down to a two-decker, although she still mounted 100 guns. She had been specially exempted, through popular demand, from the Puritan order that all the gilding of British men-of-war was to be removed and that they were to be painted “sad colour”. She had no sooner completed her conversion than she was with Blake in his action with Van Tromp off the Kentish Knock. Her yellow sides and gilt decorations stood out conspicuously among the black hulls of the other Puritan ships, and she gave such a good account of herself in the action that the Dutch promptly dubbed her “The Golden Devil”. After her baptism of fire she was constantly in action. She took part in Blake’s battle off Lowestoft, and in the action off Camperdown in which Admiral Van Tromp was killed. She proved herself one of the most efficient ships and doughty fighters in the Navy. When Charles II was restored in 1660 the old ship was laid up at Chatham, and the King specially stopped at the dockyard on his way up to London to visit her. With a happy blend of conciliation and sentiment he did not restore her old name, but rechristened her the Royal Sovereign. Under this name she set an example which has been followed by a long list of successors. The Dutch Wars gave her further opportunity to show that she was not merely a figurehead. She was also under Prince Rupert’s command when he fought his three drawn battles with de Ruyter between May and August 1673. In the second and third of these battles she had the honour of flying his flag, and in the last her captain, Sir William Reeves, was killed at the Prince’s side. In 1690 she was the flagship of Lord Torrington, with John Neville as captain, when the Anglo-Dutch fleet met the French off Beachy Head. Two years later, at the battles of Barfleur and La Hogue, she flew the flag of Vice-Admiral Sir Ralph Delavall, with Humphrey Sanders as flag captain. Once again she took her full share in the fighting and was largely responsible for the destruction of the French flagship Soleil Royal, a ship mounting 110 guns and reputed to be the finest and most powerful man-of-war in Europe. O n January 27, 1696, the Royal Sovereign was paid off at Chatham to be rebuilt. The plans were comprehensive, and apparently were to leave little of the original ship. Two days after she had been paid off, while she was in charge of a handful of ship-keepers, she caught fire in what is still known as Sovereign Reach in the Medway, and was soon blazing from end to end. The outbreak started through Thomas Couch, the chief watchkeeper, leaving a candle alight in his cabin; but it would have been easily suppressed had it not been discovered, too late, that she had no effective fire-fighting gear on board. Attempts to attract the attention of other ships in the Reach, and to borrow help from them, were unnoticed until it was too late and the pride of the Navy was destroyed. So, ingloriously, ended the finest ship of her age. Her fighting history had fully condoned the trouble which she caused in her early days. 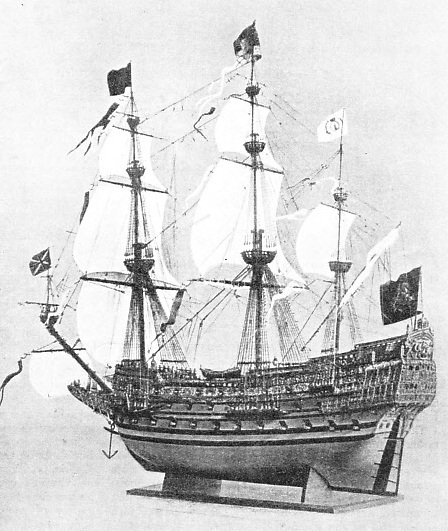 FULL-RIGGED MODEL of the Sovereign of the Seas, made by Henry B. Culver of New York. The at the top of this page shows the elaborate figurehead in detail. The ornamentation of the stern was even more elaborate. The Sovereign of the Seas was the first three-decker to be built for the Royal Navy. In addition to forecastle, half-deck, quarter-deck and roundhouse, she had three flush gun decks.